My great grandfather, Johann Berend Petermann, was born in Ganderkesee, Germany in 1843. He spent 14 years at sea with the Bremen Merchant Ships. He married and had his first child in Germany. The family emigrated to the United States circa 1881 where they settled in Hoboken, New Jersey. See Johann Berend Petermann. There were Petermanns in Ganderkesee as early as 1699. 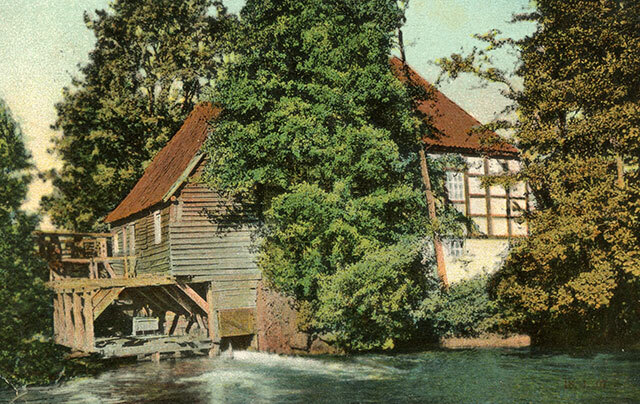 Other related families in Ganderkesee were: Alffs, Auffarth, Bremermann, Dranteman, Engelbart, Fohne, Forstein (Forstens), Goden, Hagestedt, Hayen, Hofrogge, Mencke (Menckens), Meyers (Meiers), Mullers, Neelss, Oldesbrusch, Ordermann?, Osterloh, Platen, Saalfeld (Sahlfeld), Schwarting, Stuthof, Uhlhorn, Von Ritter(n), Warrelmanand Wieting. 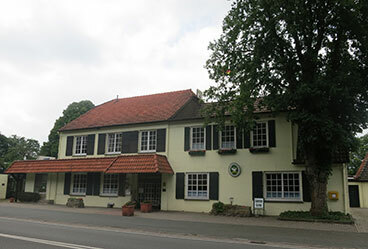 Heinrich Auffarth lived in Hohenboken at the birth of his daughter, Beke, in 1823. Johann Hinrich Engelbart was born in Schlutter in 1780. Wilke Osterloh was died in Buerstel in 1734. Dirk Osterloh was born in Immer in 1641. Alert Mencke was born in Schlutter in 1575. Sophie Hedwig Schwarting was born in Schlutter in 1787. In the late 1860s Johann Berend Petermann gave his address as Hoyerswege. 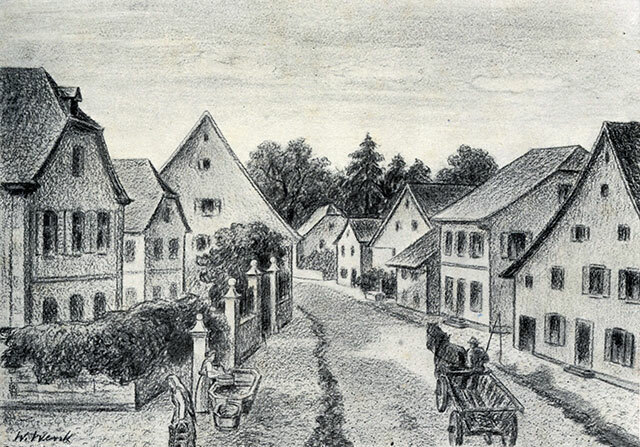 "Sethe" the birthplace of Johann Christopher Petermann in 1810. Google map shows Sethe as a small cluster of of buildings near Havekost. 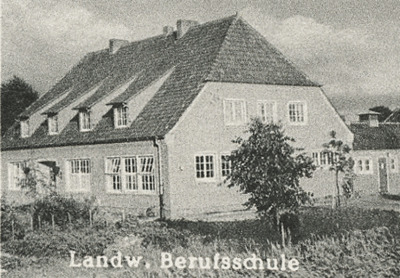 "Landwehr" was the residence of Johann Berend Petermann born 1812. The current google map shows at least three large farms in Landwehr. See Landwher below. 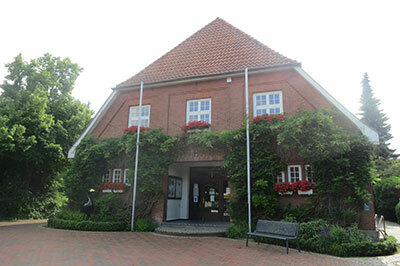 The town of Ganderkesee is located about 12 miles from the important port city of Bremen. Many of the young men from Ganderkesee went to sea with the Bremen ships in the mid to late 1800s. Around 1835 young men seeking jobs began to go to Bremmen and by 1855 296 men from the Ganderkesee area were on Bremen ships. In 1888 there were still 126 former Bremen sailors on pensions. The municipality of Ganderkesee lies between the Hunte and Weser rivers on the northern edge of the Wildeshauser Geest Nature Park in the council of Oldenburg in Lower Saxony. 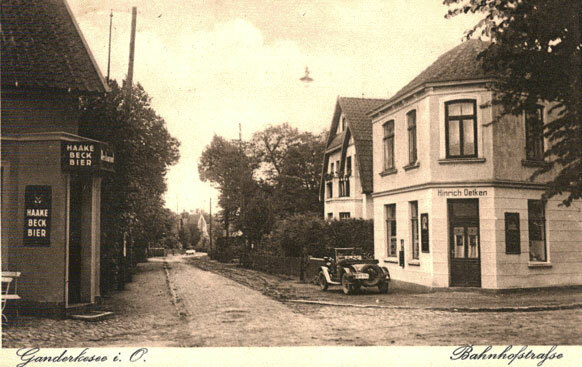 The village of Gandekesee is the center of the municipality and dates back over a thousand years. 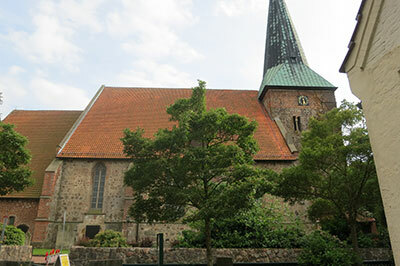 The Gaukirke, St Cyprian and Cornelius, the first stone church, was built in 1052 and contains an organ from 1699. The old village was tightly clustered around the church. The thatched roofs of the houses were very flammable and the town was almost completely destroyed by fire at least three time in a hundred years, causing great hardships for the local population. 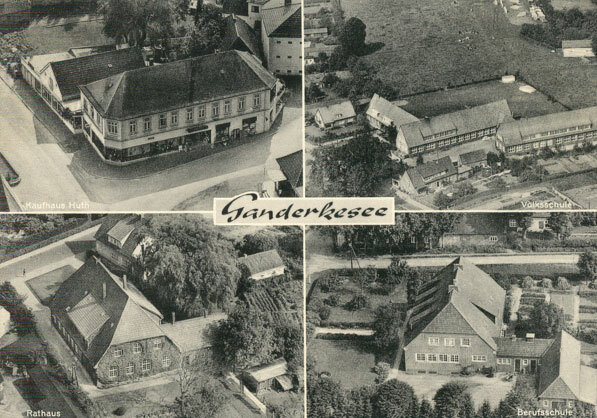 Ganderkesse was a market town and held an annual festival. 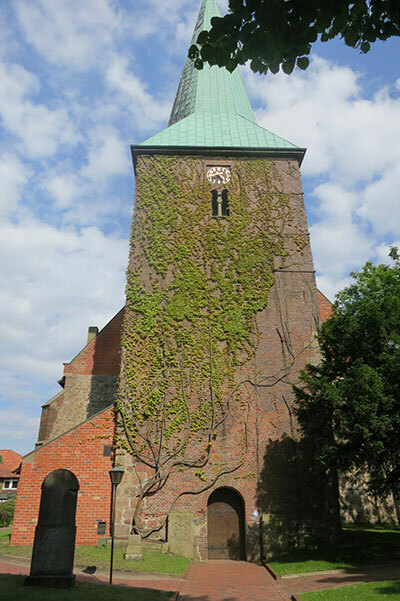 The area was ruled by the count of Oldenburg who built a castle nearby in Delmenhorst in 1260. The area was under Danish rule from 1667 to 1773. It was ruled by Duke Peter Freidrich Ludwig I Duke of Oldenburg from 1785-1829. When we visited in June 2012 we were impressed that for a town of its age, many of the buildings in Ganderkesee appeared relatively new. We also heard that the church roof was damaged by fire in 1945. In 1954 there was the "removal of the last damages of the war reconstruction of the helmut of the tower". This made us wonder why the area was bombed during the war. 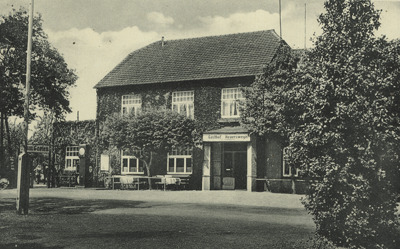 One local target was the hamlet of Hoykenkamp north east of the town of Ganderkesee. Focke-Achgelis helicopters were manufactured in an old margarine factory at Hoykenkamp starting in 1937. It was the target of a British raid the nights of June 29 and 29, 1942. The city of Oldenburg was bombed during WWII. However, Oldenburg did not suffer the damage of other German cities. It actually became a destination for refugees after the war because there was minimal damage to Oldenburg and the neighboring towns. The city of Bremen was bombed repeatedly between 1940 and 1945 with various raids targeting the railroad station, shipyards, an oil refinery, a steel mill and other plants. Many buildings in Bremen were destroyed during these air raids. Bremen cathedral was severally damaged in an air raid in 1943. Most of the Bremen passenger lists were also destroyed by fires during WWII. In March 1940 British planes dropped leaflets over Ganderkesee urging the Germany population to insist on peace. St. Cyprian and Cornelius, Ring 14, 27777 Ganderkesee, Phone: 04222 / 942 00. The records for St Cyprian and Cornelius have been micorfilme in part by LDS — films # 143101 and 143102. 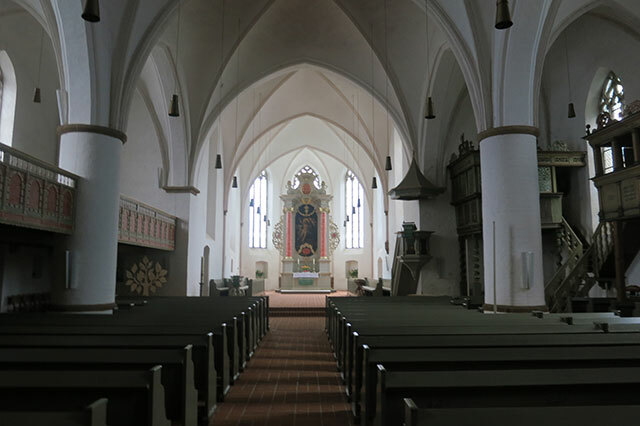 Go to Die Gaukirche St. Cyprian- und Cornelius in Ganderkesee to see images of the church. 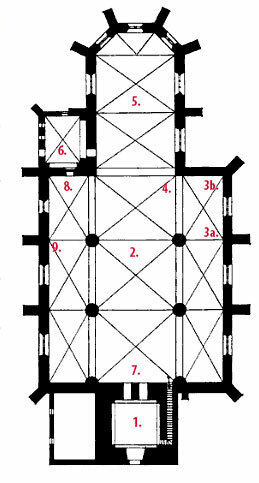 In ancient times there were seven chapels in the parish of Ganderkesee: Bergedorf, Kirchkimmen, Habbrügge, Gruppenbüren, Stenum, Schlutter and Bürstel. It was too expensive to maintain all of the chapels and so it was decided to build one large main church. Legend has it that the local farmers did not know where to built the church so the decided to let a white goose fly and when it landed they would build on that spot. Following its natural calling, the goose landed in a pool in the valley where the church now stands. The pool had to be filled with nearby earth so the church could be built. And so the place was named Ganderkesee and the arms of the town contain a white goose. 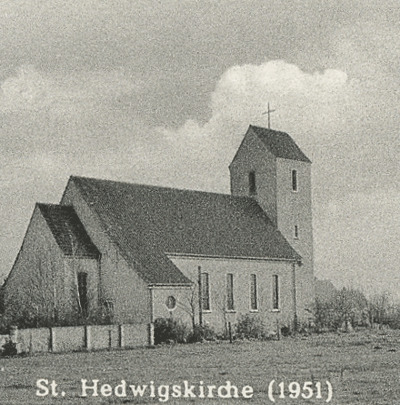 Die Kirche der Gemeinde steht zu Ganderkesee. Die Zeit ihrer Erbauung ist ungewiß und die Angaben schwanken zwischen 1050 und 1352. Die letztere Angabe wird die richtigere sein, weil die Hatten-r gewiß, wennschon 1050 zu Ganderkesee eine Kirche gewesen wäre, nicht bis 1192 nach dem fernen Niefelstcde, sondern hierher zur Kirche gegangen wären. Der Platz für den Kirchenbau soll nach der Sage zwischen da umliegenden Ortschaften streitig gewesen sein. Um den Streit zu entscheiden, ließ man einen geblendeten Gänserich fliegen unter der Verabredung, daß dahin die Kirche gebaut werden solle, wo der Gänserich sich niederlasse. So geschah es, und der Ort erhielt davon seinen Namen, der in des Drosten von der Specken oldenburgischem Erdbuch von 1428 "Ganderkescde" (de Gander lese de) lautet. Die Kirche ist groß, hat 2 groée Glocken, eine schöne große Orgel und einm hohen schlanken Thurm, der jedoch vor seinem Einsturz im Jahre 1703 viel höher gewesen sein soll. "The community church is in Ganderkesee. The date of construction is uncertain but estimates vary from 1050 to 1352. The latter figure is more correct because certainly through 1050 (I don't understand the rest, something about going to church until 1192 in distant "Neifelstcde" but have gone to church here.) According to myth, the site of the church was chosen when the locals villages decided to resolve the location dispute by allowing a gander to fly around until he "took up residence". And so it happened and the place is named for the gander "used in the Drosten of the bacon oldenburgischem Erdbuch of 1428". The church is large, has 2 large bell, a tall and beautiful organ and a single commission tall slender tower, which was, however, before its collapse in 1703 much higher. In the 9th century there was a wooden church at a 6th century Teutonic settlement. This church was destroyed by fire. Excavations have revealed that people were buried in tree coffins on both sides of this ancient wooden church. About 1050 archbishop Adalbert of Bremen ordered the construction of a simple stone hall fashioned from erratic stone blocks without a tower. In the 12th century the church was enlarged towards the East with a half round choir and towards the West with a tower. In the 13th century low aisle extensions were added both North and South. In the 15th century the church was rebuilt in the Gothic style with large columns and windows. The tower remained unchanged. The church became Protestant in 1543. In 1699 the organ was constructed by Arp Schnitger. In 1744 the Gothic alter was removed because it was too "Catholic". Some parts of the Gothic altar are now in the Oldenburger Landesmuseum. In 1945 there was a fire in the tower and the roof truss. The organs was saved. In 1974 "removal of the last damages of the war reconstruction of the helmet of the tower." In 2003 and 2005 the organ was reconstructed at great expense. The gander and lake legend is told. A more likely derivation of the town name comes from the given name GANDERIK (a combination of Gander and Rik) meaning something like "a man who rules by his mental attitude". The name of the town was GANDERKESCHE in 1584. Upon entering the church from the front one is in the tower porch, "with its thick walls date to the 12th century, when it was added to the existing stone church, erected about 100 years earlier." The present dimensions of the central hall go back to about 1450, 100 years before it was changed to a Protestant church. Two steps lead to the chancel. "For centuries the gospel has been preached every Sunday." The altar was donated by the von Witzleben family in 1744. The old sacristy is to the left as you face the altar. 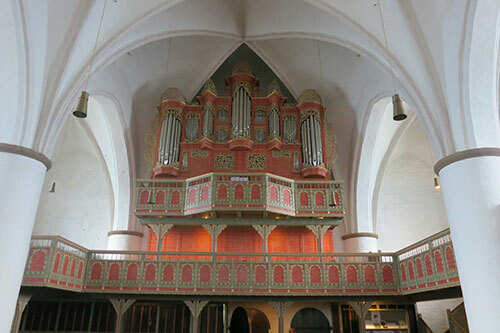 The Arp-Schnitger-Organ was dedicated in 1699. A console and pedal division was added by Hinrich Klapmeyer in 1760. 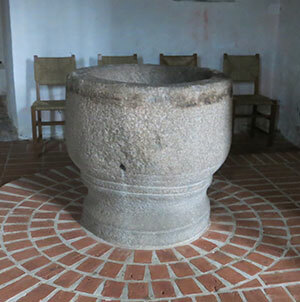 The church contains and old Romanesque font that is older than the church itself. It was found on a farm being used as a sink. 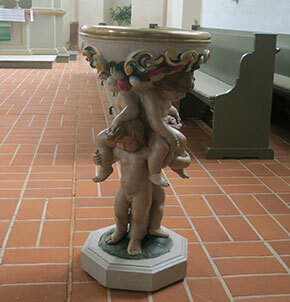 It is not certain that this font came from this church or another. Some ancient tombstones have been moved from the floor to the north wall of the church to perserve them from the deterioration. Handbuch einer historisch-statistisch-geographischen ..., Volume 2, Issue 1 By Ludwig Kohli, 1825 listed three noble estates in the Parish of Ganderkesee: Elmetoh, Holzkamp and Nutzhorn. Elmeloh is one of the oldest farming communities in Ganderkesee. The watermill in Elmeloh dates to 1445. From at least 1480 Elmeloh was in the control of the Mandelsloh family, knights who lived in a fortified house surrounded by a moat. 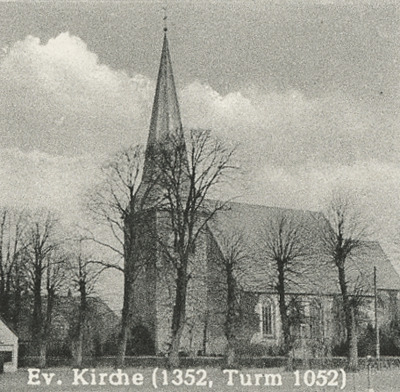 In 1692 the estate passed to the Dane Kurt Veit von Witzleben (1645-1719). The church altar was give by Adam Lewin von Witzleben who remained childless and who died in 1745. He was succeeded by his nephew, Adam Lewin von Witzleben, the younger, who died in 1766. 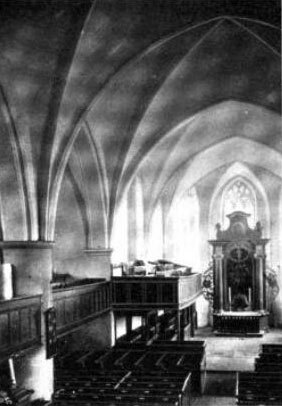 Interior of Ganderkesee Parish Church showing the pew of the Witzleben family. The Parish Records as listed above were computerized, alphabetized and printed in book form. They are available at the Parish House. There is a slight charge for doing the research yourself and a higher charge for having research done by the archivist. We spent two mornings in June 2012 doing some research. Everyone was lovely, friendly and helpful. Another view of the Rathaus. The building on the left of this image is the same as the building on the right of the above image. It is located on the same side of the street as the Rathaus. 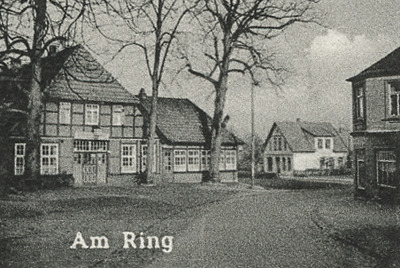 Am Ring [The Ring] located in the center of the village around the church. The church steeple in the background. 1816: In 1816 there were 19 tavernkeepers (? ), 1 miller, 3 "Delmuller", 29 carpenters, 7 scissor grinders, 7 roofers, 27 tailors, 21 shoemakers, 5 barrel makers, 5 musicians, 3 wood turners, 5 wooden shoe makers, 6 masons, 9 blacksmiths, 2 wheelwrights, 2 butchers, 2 brick makers, 3 tanners, 5 hawkers or shopkeepers, 1 midwife, 1 brewer, and 1 "Branntemeinbrenner" [literally burn my brand (or burner)]. "Der Boden ist fast durchgangig wellenförmig eben, stach, hin und wieder mit einigen kleinen Anhöhen untermischt, von denen man an einigen Stellen, z. B. bei Hohenböken, eine schön Aussicht ins Stedingerland, und bei Schlutter ins Hoyaische hat. Die Hauptbestandtheile des hiesigen Bodens sind Haid-und Moor-Erde und Sand, mitunter auch Lehm oder Dwo. Wahrscheinlich würde sich auch hin und wieder Mergel finden, wenn man sorgfältig darnach suchte. Da, wo sich fruchtbarer Lehm findet, könnte dieser mit gutem Nutzen auf die sandigen Aecker gefahren werden, oder, wo er nicht über 1 bis IV2 Fuß tief unter der Oberstäche der Aecker liegt, wol durch tieferes Pflügen hinauf gefördert werden, und wo er tiefer liegt, könnte auch hier das in der Marsch fast allgemein übliche Wühlen vielleicht mit gutem Erfolg angewandt werden. Aber die sonst so fleißigen Eingesessenen dieses Amts bleiben, wie auch die in andern hiesigen Geest-Aemtern, noch immer bei der alten Gewohnheit, außer dem thierischen Dünger (Mist) fast nichts als sogenannte Plaggen auf die Aecker zu bringen, obgleich diefe Plaggen oft fast eben so mager sind, als der Acker, den sie damit düngen wollen. Daß der hiesige Boden, ungeachtet seiner natürlichen Magerkeit, gegen den auf ihn verwendeten Fleiß seiner Besitzer nicht undankbar ist, sieht man daraus, daß er bei guter Bearbeitung und Düngung in einigen hiesigen Feldmarken, z. B. in der des Dorfes Ganderkesee, von Rocken das 8te bis 10te, von Gerste und Hafer das 12te bis IZte Korn giebt, und bei vorzüglich günstiger Witterung wol noch mehr. Den schwersten Rocken (2 Scheffel 39 - 40 Pfund) bauet man auf dem Vielsiedter Felde und auf einem Theil des Hurreler Feldes, der daher auch viel zum Brannteweinbrennen gesucht wird; mit unter auch zu Saatrocken. Eine bestimmte, ü berall im Amte gleichförmige Ackerwirthschafts-Methode findet hier nicht statt; sondern der Eine befolgt diese, der Andere eine andre Methode; - im Ganzen aber ist eine Art von sogenannter Dreifelder-Wirthschaft bei den hiesigen Geest-Bauern die herrschende. Einige wenige Gutsbesitzer machen zwar davon eine Ausnahme und treiben ihren Feldbau nach der rationellen Ackerwirthschafts-Methode, finden aber bei den kleinen Landbesitzern keine Nachahmung"
The terrain is an undulating flat plain, with occasional small hills, from which one has in some places, such as Hohenböken, beautiful views of the Erland Steding, and the Schlutter Hoyaische. The local soil is made up of "Haid" earth, sand, clay and sometimes "Dwo". One can occassionaly find marl if one looks carefully enough. Where fertile loam exists it could be used with good benefit on the sandy lands - deeper plowing could provide greater sucess. But the otherwise busy residents of the Registered Office, as well as in other local Geest offices, keep the old habit, except for the animal manure (Dung) almost nothing but so-called turf is used on the lands. The dief turf is often as thin as the field they want to fertilize. The local soil, regardless of its natural leanness, does produce with hard work by its owners, you can see that with good cultivation and fertilization in some local fields, for example, in the village Ganderkesee, from the 8th to 10th, barley and oats from the 12th until "IZte" grain, excellent production and "WOL" and even more in good weather. The hardest "rocking" (2 bushels 39-40 pounds), one "builds" on the Vielsiedter field and on one part of the Hurrel field that is so much wanted for "burning" brandy, also under Saatrocken. Certainly uniform arable husbandry method do not take place everywhere. The other - a different method - is a kind of three-field-husbandry at which the local Geest farmers excel. A few landowners make an exception of their field crops and use the rational field husbandry method, but the small landowners do not follow their example. Handbuch einer historisch-statistisch-geographischen ..., Volume 2, Issue 1 By Ludwig Kohli, 1825 listed: three noble estates in Ganderkese, Elmetoh, Holzkamp, and Nutzhorn, a free "place" [vacancy?] at Schlutter, 64 full buildings, 85 half buildings, 76 dogs, 392 "Brinksitzer" [farmers], 462 hired men, 923 hearths, 5389 inhabitants. The town of Ganderkesee (the seat of the Duke of Delmenhorst (? )), the church and parish house, the house of the organist (who was also the clerk and school principle) various artisans and other tradesmen. The charming village of Schlutter. Archbishop Gerhard I von Bremen, Count of Oldenburg-Wildeshausen, built a castle in Schlutter in 1213. 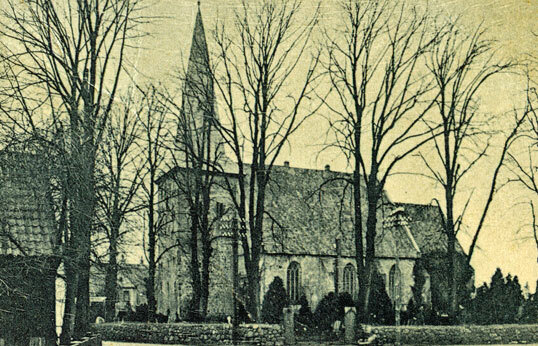 The castle was destroyed in 1220 and the fiefdom was sold as a result of the Stedingern feuds.There was an ancient church or chapel in Schlutter. 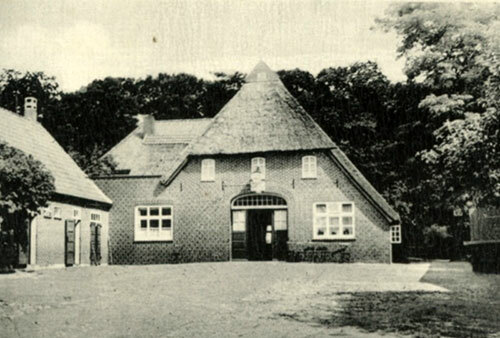 At one time Schlutter belonged to the "office" of Delmenhorst. 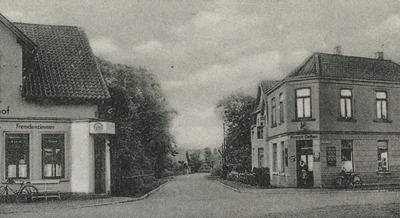 The village of Adelheide named for the "too soon asleep" princess was a newly created village in 1817. Note: Princess Adelheid of Anhalt-Bernburg-Schaumburg-Hoym was born in 1800. She married Frederick Augustus of Oldenburg and became a duchess. She died in 1820. Holzkamp - Count Gerhard the Brave gave Holzkamp to Arend of Weyhe (date?). Later the count bought it back and turned it into a small farm. In 1656 Count Anton Gunther sold it to the Royal Swedish clerk Benedict Stolting of Stotel (in the duchy of Bremen). It was later sold again - the owner not named. Siebenhausen - seven houses - which according to legend got its name from houses located there but were destroyed under Count Gerhard. 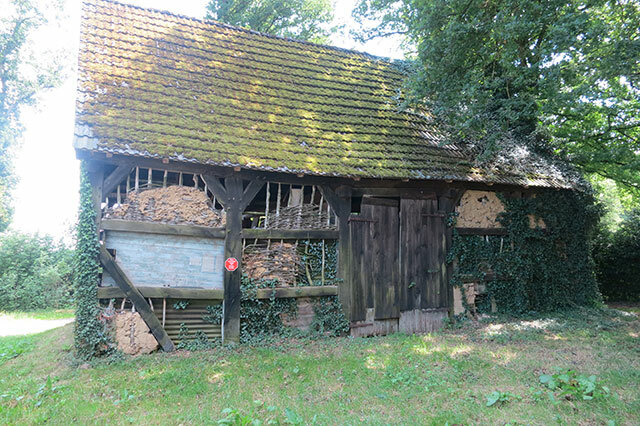 Hengsterholz - formerly known as Hesterholz in addition to others is inhabited by several scissors grinders. 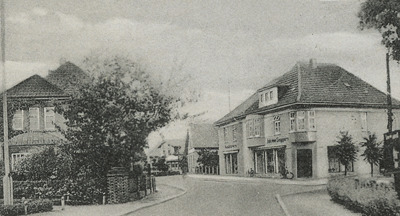 There was a boarder crossing between Oldenburg and Hanover. The local product tithe belonged to Hanover and Oldenburg in common and each half is annually sold to the highest bidder, usually at the tithe requirement. Immer a pleasant village with beautiful oak and beech bushes. Between this place and Buchen-Buschen is a part of the so-called pagan wall, probably a relic of an ancient Roman bastion. 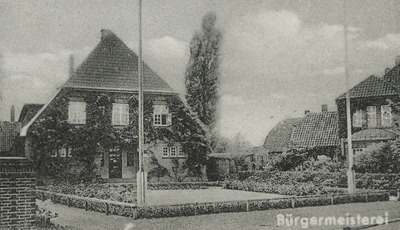 Burstel which was said to have had a chapel in ancient times. See Burstel below. Bergedors oder Bastrup is remarkable in the story of the fatherland because the Oldenburg Count Christian II mentioned it on his return from the Holy Land (Palestine) from the Crusade of 1189 (The Third Crusade or Kings' Crusade. The Emperor Frederick I died while on this crusade.). The area was known for its fruit trees and bee keeping. It was generally not know for fishing as the rivers were small and there were no large lakes. Small land owners (brinkstizer) were common. The parish of Ganderkesee inclued 3 ""adelig freie Güter" [noble free goods] Elmeloh, Holzenkamp and Noyhorn. 64 volle Bauen [full building], 85 halbe Bauen [half buildings], 76 Köter [mutt/dog], 392 Brinksitzer [farmers], und 462 Heuerlinge [laborers] 923 Feuerstellen [fireplaces] 5389 Einwohner [inhabitants] among which were: 1 miller, 3 "Oelmullers" [oilmillers? ], 1 Holzhan [something to do with wood], 29 carpenters, 7 Scherenschleifer [scissor sharpeners], 7 "Drachbecker, 27 tailors, 21 shoemakers, 5 coppers/barrelmakers, 5 musicians, 3 wood turners, 5 wooden shoemakers, 6 masons, 9 smiths, 2 "Rademacher" [wheelwright]., 2 butchers, 2 Ziegelbrenner [brick makers], 3 tanners, 5 hucksters or shopkeepers, 1 midwife, 1 brewer, and 1 distiller. 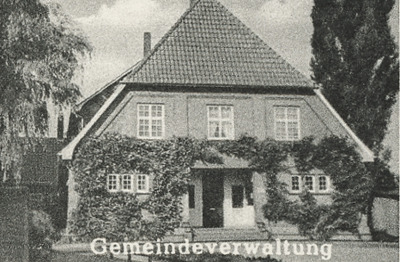 The Osterloh family lived in Buerstel, a hamlet in the town of Ganderkesee. In "ancient times" there was a chapel in Buerstel. "d. Zu Bokelesch, Ksp. Strücklingen, im Herrenholze, hält sich ein weißes Pferd auf; viele haben es schon gesehen. - Auf dem Kirchhofe zu Ganderkesee zeigt sich nachts ein Schimmel. Gewöhnlich zeigt er sich bei der Habbrügger Pforte, aber auch an anderen Stellen im und in der Nähe des Dorfes. Einst kam ein früherer Pastor zu Ganderkesee im hellen Mondenschein um Mitternacht von einer Hochzeit. Als sie über den Hexenberg zwischen Bürstel und Ganderkesee fuhren, stand mit einem Male an jeder Seite des Weges ein großer Schimmel mit feurigen Augen und hielt die Zunge aus dem Halse, sich bäumend, wie man Pferde wohl auf Wappen sieht. Der Pastor mußte zwischen ihnen durch. Er sagte aber "Herr, führe uns nicht in Versuchung," und in demselben Augenblicke waren die Schimmel verschwunden." [d. Ksp For Bokel Esch. Strücklingen, in the men's wood, holds on a white horse, and many have seen it already. - In the churchyard in Ganderkesee a white one can be seen. He usually appears at the Habbrügger gate, but also in other places in and around the village. Once a former pastor came to Ganderkesee in the bright moonlight at midnight from a wedding. As they drove across the mountain between Witches mountain and Bürstel Ganderkesee, there stood at once on each side of the road a large white horse with fiery eyes, his tongue stuck out of his mouth, rearing, as you see horses on a coat of arms. The pastor was about to pass between them. But he said, "Lord, lead us not into temptation," and at that moment the horses disappeared. Aberglaube und Sagen aus dem Herzogthum Oldenburg, Volume 1 By Ludwig Strackerjan, 1867. Elmeloh is one of the oldest farming communities in Ganderkesee. The watermill in Elmeloh dates to 1445. This wind mill is not in Habbrugge but is indicative of the type of windmill and the terrain around Ganderkesee in earlier times. Hohenboken is a hamlet between Oldenburg and Bookholzberg, north of the town of Ganderkesee. 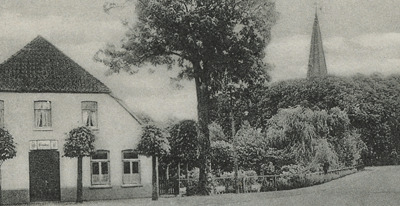 Heinrich Auffarth lived in Hohenboken at the birth of his daughter, Beke, in 1823. "Wie die ganze Umgegend des Vesuvs vulkanischer Boden ist, so hat auch sonst Alles um den Haßbrook her einen alterthümlichen Anstrich. Die Wohnungen in denen die Bauern hausen, liegen noch alle so weit verstreut umher, wie Tacitus dieß in seiner Germania beschreibt. Auch sind sie gewiß noch heutzutage nicht viel anders eingerichtet als wie damals. - etwa mit Ausnahme der Fensterscheiben. Die Gehöfte, die wir zwischen dem Stenumer und Haßbrooker Walde passirten, und in deren offene Thoren und Thören ich unterwegs immer wieder gern eintrat, hatten eben so alterthümlich klingende Namen als Einrichtungen. So hieß der eine "Hohenboken", der andere "Ohlenbusch", ein dritter "Wupperhorst." Jeder große Bauernhof hat hier so seinen eigenen Namen und die Bauerfamilien, die darauf wohnen, haben gewöhnlich die Namen ihrer Residenz auch als Familiennamen angenommen, indem sie dann den Lokalnamen noch einmal hinzufügen. So kam ich z. B. zu einem Bauer, Ohlenbusch to Ohlenbusch". (Altenbusch zu Altenbusch). 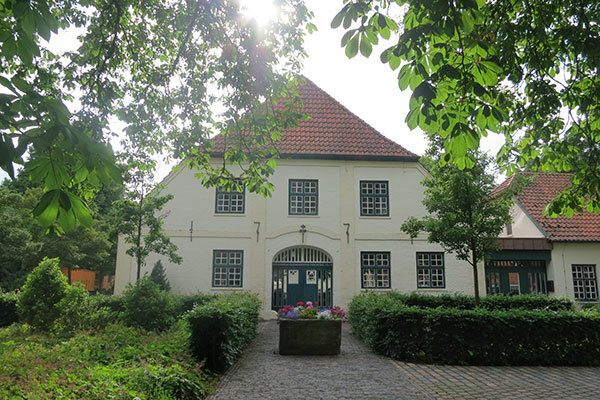 Ein anderer hieß "Hinrich Wupperhorst to Wupperhorst", ein dritter "Brokshus to Brokhus". Zuweilen ist der Familienname verschieden von der Residenz, so heißt z. B. der auf Hohenböken: "Meyer to Hohenböken". Die Bauern werden nicht nur im gemeinen Leben in der angedeuteten Weise bezeichnet, sondern sie unterschreiben sich auch so. — "Die Wuppenhorsts". so sagte mir Ohlenbusch. 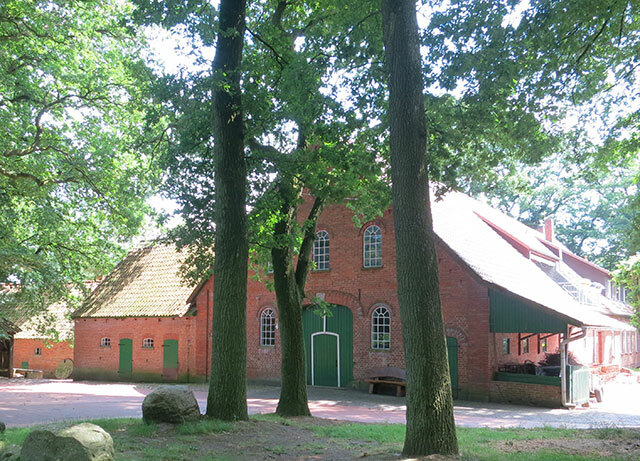 "sitzen schon seit 700 Jahren auf ihrem "Hofe Wupperhorst". Mehre von diesen Bauern sind in neuerer Zeit sehr reich geworden. Dennoch aber sind sie ganz unverändert vollständig bäurische Bauern geblieben. Sie leben ganz nach der Väter Sitte, führen keine Neuerungen und Verbesserungen ein, nicht tinmal Blitzableiter und Schorrsteine, obwohl sie ihre alten eichenen Truhen voll Geld haben. Einem reisenden Bürger aus den Vereinigten Staaten, wo jeder wohlhabend gewordene Mensch sogleich wie ein mit Gas gefüllter Luftballon sich vom Bodeu erhebt und in andere Regionen schwingt, würden vermuthlich diese uralten, seit 700 Jahren hier hockenden und stockenden Bauernsamilien noch viel merkwürdiger gewesen sein, als die alten Eichen von Haßbrook selbst." Like the area surrounding the Vesuvius volcano the terrain around Haßbrook* looks like an ancient painting. The dwellings in which the peasants live, are still scattered all around as far as Tacitus in his Germania describes Diess. With the exceptions of windows, they are not dissimilar to what they were then. The farms we passed between Stenum* and the Haßbrooker forest, and through whose open open gates I go enthusiastically had as antiquated sounding names as constructions. One was "Hohenboken", another "Ohlenbusch" and a third "Wupperhorst". 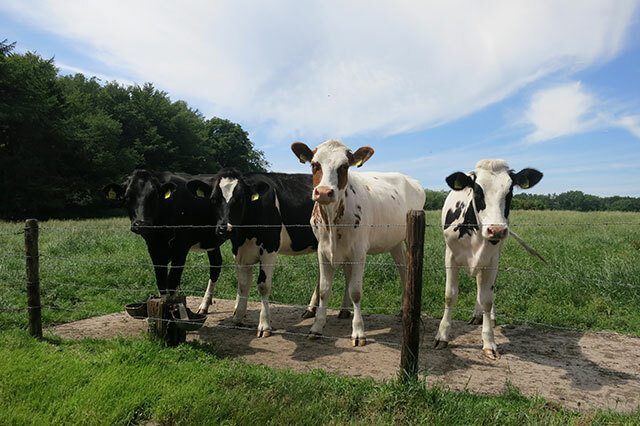 Every large farm in the area has its own name and the farming families who live there have usually adopted the name of their residence as a family name, by then the local name from another time. For instance a farmer Ohlenbusch to Ohlenbusch. (Altenbusch zu Altenbusch) [Old Busch to Old Busch]. Another was called "Hinrich Wupperhorst to Wupperhorst", a third "Brokshus to Brokhus". However, sometimes the surname is different from the residence, ie for example with Hohenboken, "Meyer to Hohenboken". The farmers are not only known that way in everyday life but they sign themselves that way - "The Wupperhorsts". Ohlenbusch told me he had been 700 years on the "Hofe" [court] Wupperhorst. Several of these farmers have recently become very rich. But they are still unchanged remaining completely peasant farmers. The live completely by the customs of their fathers and do not make new constructions or improvements, not lighting rods or "Schorrsteine" even though they have oak chests full of money. To citizens traveling from the United States, where every man who has become wealthy immediately rises like a gas filled ballon from "Bodeu" and swings in other regions this seems ancient, 700 years squatting and stagnating on a farm is even more remarkable than the old oaks of Haßbrook. **Stenum is a village between Delmerhorst and Hohenboken. Hohenboken church BMDs are listed in Ganderkesee. Landwehr indicates an ancient large scale low strength fortification such as a dirt mount or ditch. The Landwehren near Ganderkesee were a medieval border security systems which protected the Court of Delmenhorst from enemy attacks. The 14th and 15th century Ganderkesee Landwehr stretched as far as Nuttel. The fortifications consisted of several mounds with a wall of up to 10 meters in width and 6 meters in height. On the walls were thorn reinforced wooden fences. In font of the wall was a large trench or ditch. Enemy attackers avoided these military installations because the losses were to great to warrant assault. Today only remnants of the fortifications remain. 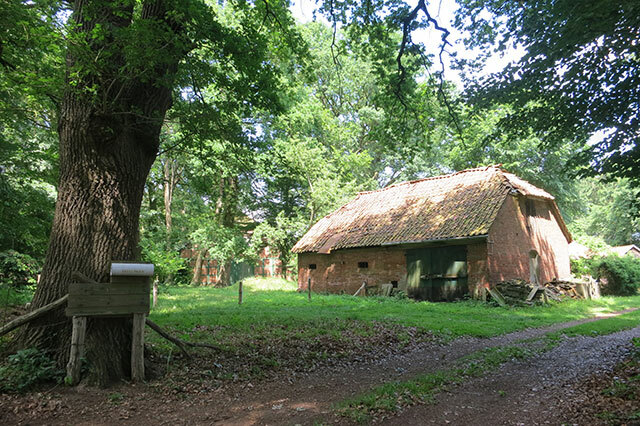 The farm buildings in Landwehr were surrounded by lovely forests. Schlutter was mentioned in 1200. From 1213 it was the Schlutterberg a strong castle of the Archbishop Gerhard von Bremmen. Schlutter is described by Wikipedia as a hamlet in the Municipality of Ganderkesee. Schlutter was mentioned as early as 1200. 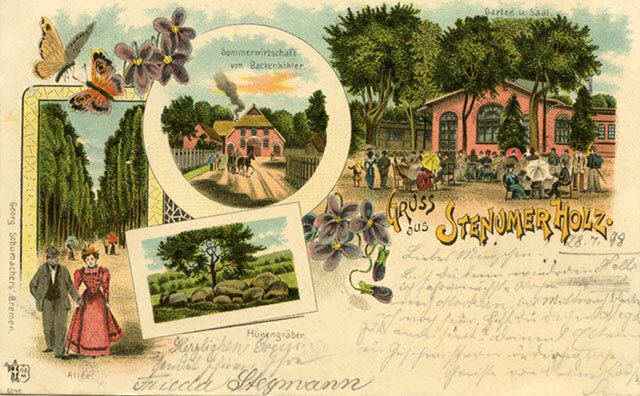 In 1825 and 1844 Schlutter was noted for its plantings of fruit trees for commercial purposes. Bernard Schwarting was born in Schlutter. His father, Johannn Bernard lived in Schlutter at the time of his marriage to Gersche Margarete Struthof in 1785. Bernard and Gersche had children born in Schlutter between 1787 and 1796. They were still living in Schlutter at the marriage of their daughter Sophie Hedwig in 1806. A 1939 to 1945 memorial marker at an intersection near Schlutter lists Bernhard Schwarting and Hans Schwarting of Schlutter. Ahlert Mencke was born in Schlutter in 1575. His son Hilmer was born in Schlutter in 1602. Hilmer's son, Cord was born in Schlutter in 1633. The next generation was in Habbrugge. A 1939 to 1945 memorial marker at an intersection near Schlutter lists Johann Menkens of Schlutter. 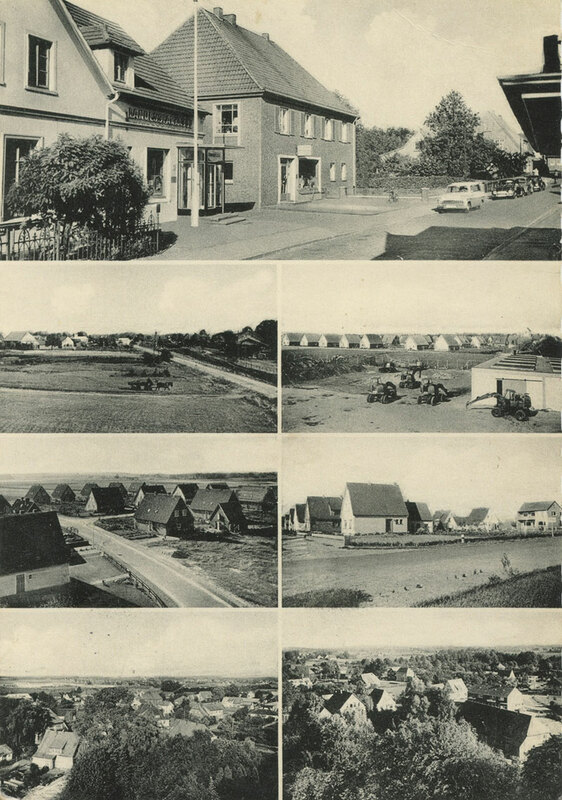 In 1857 Schlutter was listed with 37 inhabited buildings, 47 uninhabited dwellings, 42 houses, 42 households, 123 males, 112 females. Stenum was a village in medieval times and dates from at least 1275. It is located next to Stenum forest noted for its ancient oak trees. Some are said to be over 1,000 years old. Stenum Forest is located on the edge of the Wilderhauser Geest, a landscape that was formed by ancient glaciers. Stenum is also known for its stone age megaliths or Chamber tomb. Forest path and the chamber tomb at Stenum. 1 Der Französische Kayser-Staat under der Regierung des Kaysers Napoleon des... by Albrecht Friedrich Ludolph Lasius. The Oldenburg State Railroad ran from Bremen to Oldenburg through Delmenhorst and Ganderkesee. "The whole area as far north as Grüppenbühren provides a lot of very capable sailors for large carriers. Therefore, the peculiar boat-like character of the small houses can also be seen here." Ganderkesse, situated slightly higher than the surrounding area, derives its name from "verschiedene sehr unwahrscheinliche Lesarten." [several very improbable interpretations]. Mention is made of Heindenwall where remains of old ramparts were to be found also of the Stüh forest which was still in existence. "Die großn Buchen sind aber gelichtet, die Reiher seit 1891 verschwunden, auch die von Kohl beschriebene Frieseneiche steht seit 1890 nicht mehr. Some of the ancient forests remained in the area. weit näher der berühmte Hasbruch, einer der uralten Eichenwälder des Oldenburger Landes. Nur ein kleiner Teil des Waldes ist jetzt noch von der forstmäß igen Benutzung ausgeschlossen. Neben den sehr alten Eichen, von denen die größten Namen führen, sind auch einzelne alte Hainbuchen beachtenswert. Der Wald wird in der Umgegend nur "der Brook" genannt. The famous Hasbruch, one of the ancient oak forests of Oldenburg. Only a small part of the forest is now excluded from forestry "moderation" (?). In addition to the very old oak trees of which the biggest names lead (?) some old hornbeams are also noteworthy. The forest is known locally as "the Brook". Apparently it was better to have the locals lead one into the forest. It was noted that there was a forest near Grüppenbühren, which is north of Ganterkesee and south of Bookholzberg. Hahn also says that many of the farmers took their names from the name of the farm. The area was described as "öder" [bleak or barren] with much heath and moorland with small groups of houses along steams and in the more favorable areas. Hanh also mentions a stone monument at Stenum. 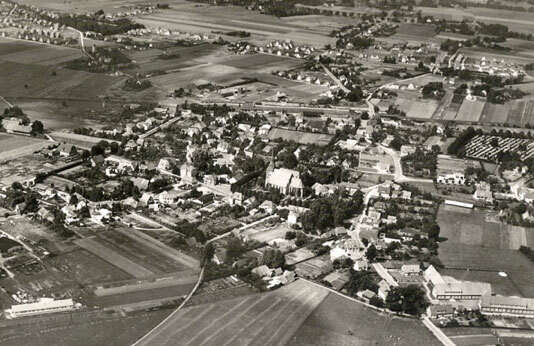 Ganderkesee from the air circa 1960 - the church is in the center. The cemetery included some modern tombstones that carried some of the Petermann related family names. Included were, Struthof, Alfs, Englebart, Menkens, Schwarting and Auffarth. Osterloh was common in the local phone book. 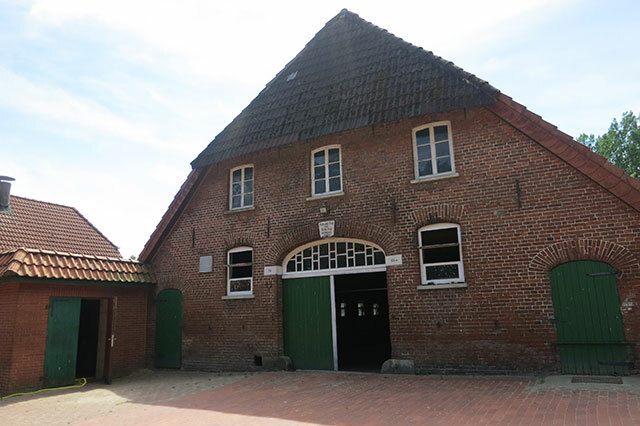 An impressive collection of old farm buildings, several windmills, a manor house and other buildings from Friesland and Lower Saxony have been lovingly moved to the site. There are more than fifty buildings from the 16th century to the beginning of the 20th on the museum's 15 hectares. All of them have been moved from the site of their original construction. 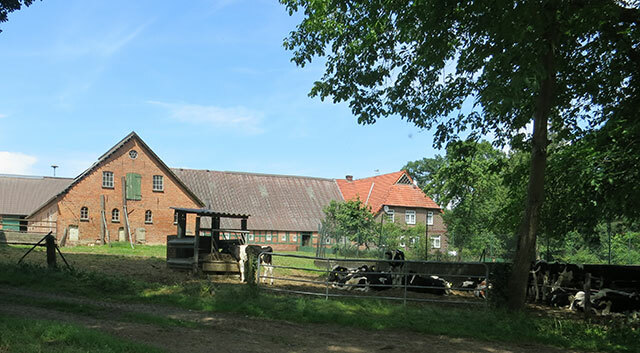 They include large farms as well as Quatmann's and Wehlburg's farms, medium-sized farms like those of Hakke of Hoffmann, as well as the residential buildings and workhouses of hirelings and tradesmen. 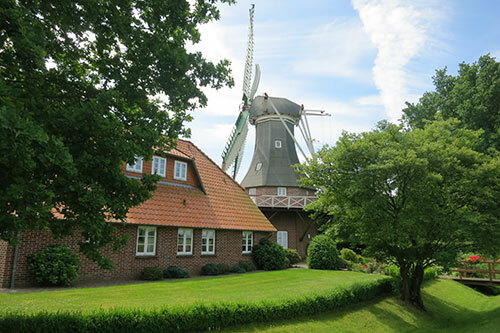 The special attractions include three windmills, a manor, church and a school on the museum's property. The ensemble of buildings at the open-air museum offers insight into the daily lives and cultural history of the entire northwestern region. On the 1.5 acre with historic buildings and objects of the 17th to 20 Century. The objective of this Regional Museum was and is the collection and presentation of artifacts of everyday living and working conditions of past historical eras of the region. A special emphasis is on the developments in the last two centuries. 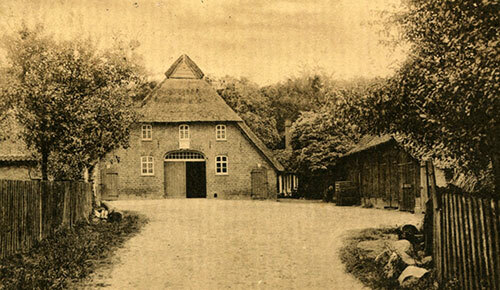 In 1992 active volunteers of Twistringen Association decided to preserve the history of the straw in Twistringen. 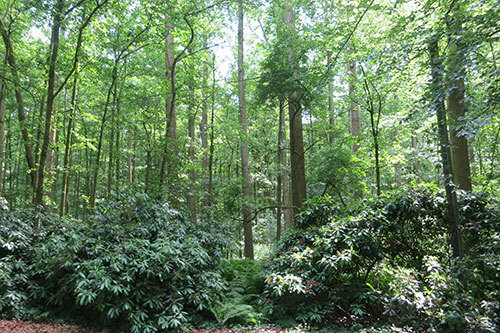 Naturpark Wildeshauser Geest is located southwest of Bremen and Oldenburg. Between Wildeshausen and Oldenburg canoeists can enjoy a really romantic experience. Mixed forests, coastal erosion, lush meadows and fields line the meandering course of the Hunte river. This is home to sand martins, sandpipers, the colourful kingfisher and diverse dragonflies - untouched nature. Engelbart, The Engelbart Family in Ganderkesee - including Osterloh, Alff, Menke, and Swarting.